Editor’s Note: This presentation was given by Luanne Misquitta at GraphConnect Europe in May 2017. In this presentation, Luanne Misquitta shares her facility for engaging with the challenges of human capital management (HCM) in contemporary organizations using graph technology. She describes the the evolution of HCM and how contemporary organizations are made up of teams that form and reform depending on current needs, and how this translates into the traditional problems of recruiting, learning, performance evaluations, and talent management. 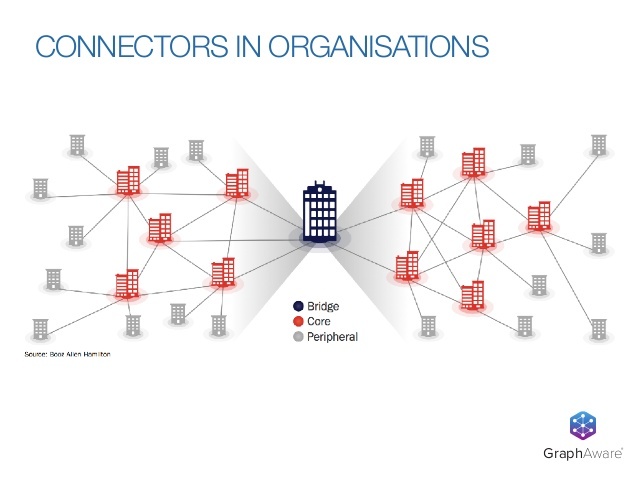 She explains how graphs can help you find hidden potential in your organization and address the latest HCM trends including people analytics and viewing your organization as networks of teams. 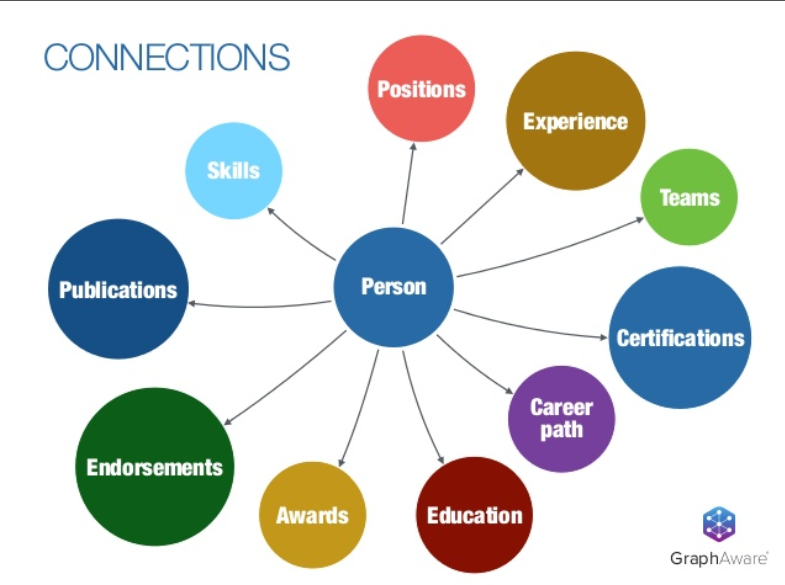 She explains organizational network analysis and describes how graphs enable you to quite literally bring it all together and take your HCM to a new level. 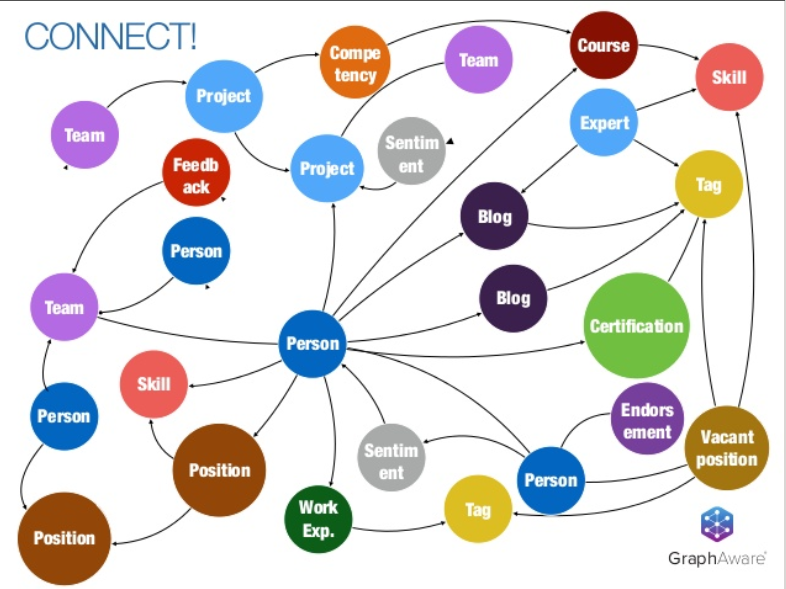 What we are going to be talking about today is the application of Neo4j in human capital management (HCM). Human capital management (HCM) is very interesting to me personally because I started my whole journey with graph technology working at a people management company. Today I’m going to talk about the application of Neo4j in people management or HCM, as we know it. We are not going to talk about HR – a very old concept which has been transformed into HCM. HR was human resources. It’s always been a part of most companies, and back in the day it dealt with personnel files, paying salaries, generating performance reviews, awarding bonuses, and resolving minor conflicts. But that’s about all it was. It was called human resources, and nobody calls people working in companies “resources” anymore (or at least they shouldn’t). 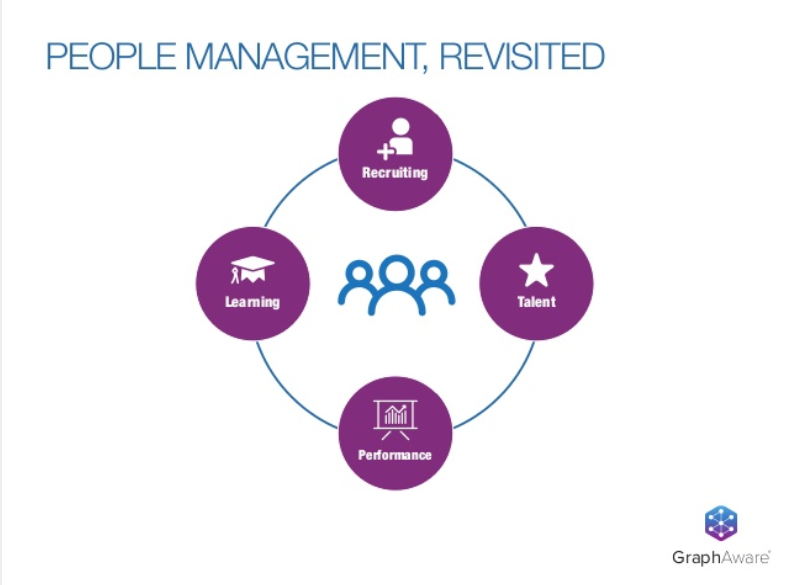 Human capital management is now focused on people as capital for your company. People are the most valuable asset you have. They drive your profits. Good teams contribute to your revenue. Bad teams can do terrible things to your company. So HCM manages the life of a person in her career while she is at your company. Also today, HCM is important because people are the ambassadors of your company, thanks to places like Glassdoor, where people can go and publicly complain (or compliment) their boss and their companies. In the ’50s, when the whole industrialization movement started – mostly driven by Henry Ford – the focus was on operational efficiency. You drove profits by operations. People were tools to get the job done, so HR was very applicable at this time. But then there were new management styles that started being introduced between the ’60s and ’80s that changed the structure of the organization and those styles made organizations more hierarchical, where the executives had all the power. People were heavily managed. They were managed by goals. They were managed by objective. In the 1990s, with thought leaders such as Steve Jobs, you begin to focus more on the people in your company but the primary focus is still on the individual. You had star performers in your company. And those were the people you recognized. You also had people who were not star performers, and as you’ll see, it is a bit of a problem when you focus only on individuals. Customer service became a driving factor, and therefore top-down, hierarchical management no longer worked because it never goes hand-­in-­hand with customer success. Today, people are still important but the focus is not on the individual: it’s the team that’s important. So if your team performs well, you do well collectively. It’s no longer acceptable to have a high-­performing individual who’s not a team player because this causes more problems in the long run. You still have high-performance individuals, but then you have to find a role that suits them because they are not team players. So we are in an age where we talk about networks of teams and the moment you see networks, it automatically indicates that you should probably be using a graph. People in companies are very connected. Everything about a person at your company is connected. Think about skills, what position he occupies, what position you want to promote him to. And what if he wants a different position? Her experience, the teams that she belongs to, her certifications: there is a well-defined career path that you as an organization would like to have your employees work on because that helps you retain employees. Endorsements, awards, education: everything is connected. They are connected to a person, but they are also interconnected. Because everything is connected, there is value in relationships. People data is highly connected. Any organization is made up of connections. And this data is not always very structured, especially nowadays because you have internal social networks and employees providing feedback on various items in various forms. Your data could start out sparse and it could grow. It is no longer something that you know upfront, plan for and put it into structured tables. More importantly, there are very interesting implications in your second- and your third-level relationships. You’ve already seen what the first-level relationships are. You can do a lot with just first-level relationships. But you can do even more with second- and third-level relationships. For example, what skills do people have which are not part of their formal job description? You probably hired someone based on skills that you were looking for. Most likely, they have additional skills that you can leverage in your company. But do you know what those skills are? Do you know how you can apply them in your company? Some people serve as top talent attractors. They attract more and more talent into the organization. And if you don’t know who these people are and they leave, what it really implies is that you’ve lost people who bring in good people. So how do you find top talent attractors? What learning activities do you recommend to your top performers to get them ready for the next step in their career path? How do you retain top performers? You give them interesting work. You enrich their career path. You put them on track to be promoted. But how do you find top performers? How do you know what they want to do? How do you recommend things for them to do? It all goes back to what Neo4j CEO Emil Eifrem has always said in the past: what is core to your business has to be connected. And people are core to any business. 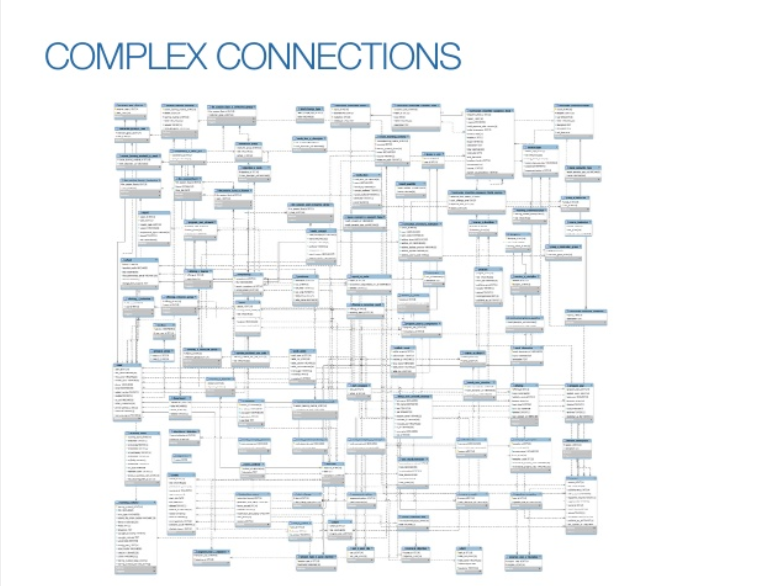 Now let’s talk about the Neo4j graph database. It’s actually very simple. It’s a labeled property graph model – not relations but properties. What’s important here is that your relationships are first-class citizens. A relational database (RDBMS) also has relationships, but they are not first-class entities. And it’s very difficult to extract value out of those relationships. 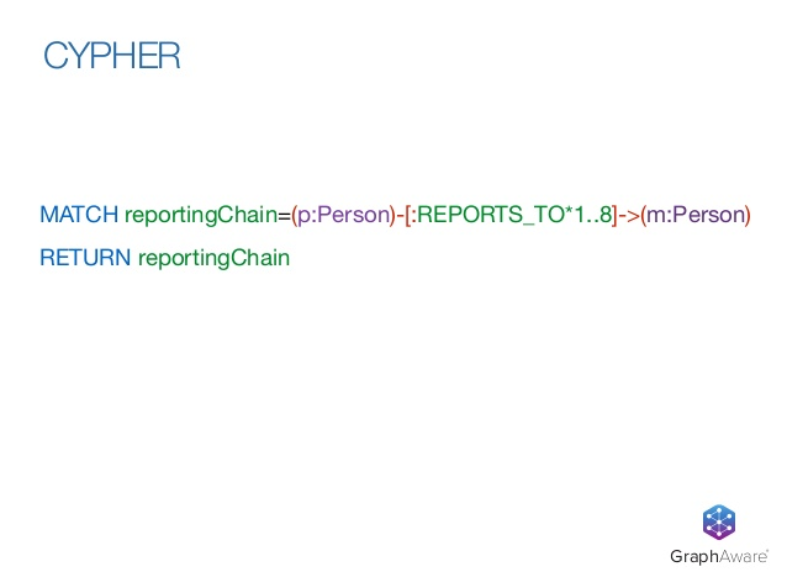 With Neo4j, there’s no need to infer connections using out-of-band processing or using foreign keys. It’s very explicit. It’s right there for you to exploit. Second, it’s flexible. You can find patterns easily. It’s efficient to query, and it’s schema-free so it’s very easy to evolve over time, unlike traditional database tables where you have to know your data structure in advance and when you need to change it you’re in a lot of trouble. With Neo4j you can easily evolve, which is very relevant to today’s organizations where the amount of data you collect from various sources keeps growing and changing over time, and you need to be able to model this data quickly to take advantage of it before it’s too late. Everything was put into tables and columns, but the fact is that your data does not really fit into tables and columns. It’s forced into that structure because 10 years ago that was all you had. The problem with this is that it’s easy to put the data in, but when you want to get it out and examine relationships between data elements, it gets harder and harder, as you join across more and more, and still more, tables. Next you start to denormalize the tables. And then you end up with the inverse of what you actually wanted. You wanted a structured database but it didn’t fit, so you denormalized it. Now it’s not structured, and it’s still not efficient. This is simple, easy to understand, easy to write, and much, much faster than you would ever get out of a relational database. And this is the core of people management. It’s your reporting chain. Imagine how much more you can do when you extend this to all other aspects of your organization. People management suites traditionally have been broken down into a couple of areas, and they’ve been fairly isolated silos. Recruiting and onboarding: find people, get them into your organization, and train them. Formal training processes: These are needed for two reasons. One is because you need to train employees to get them new skills so you can get customers, and the other is for compliance reasons. Performance: The much-dreaded performance review is a whole product in people management suites. It exists to rate employees and deliver a review. Talent: This is one of the later modules that came about, maybe 12 or 15 years ago, and it focused on retaining talent, identifying people who were likely to leave. The reality is, people management software has really been more or less the same for all these years. If you continue reading the reports produced by analysts, such as Bersin, you will find that they mostly say the same things over and over again. There hasn’t been a good solution to all this. But apart from these modules is one more which is fairly hot these days: people analytics. About 71% of companies see people analytics as a high priority. This is from Deloitte’s 2017 Human Capital Trends report 2017. It’s a very high priority, but where are we with people analytics? If you look at the bottom, the lowest level is Operational Reporting, which is a standard report for compliance. Then you go into Advanced Reporting where you have analysis of trends, maybe some kinds of benchmarks. Next is Advanced Analytics, where you’re trying to find issues and solutions through data. The top level is Predictive Analytics where you’re looking for things like which people are likely to leave. How is my company growing? What does my succession pipeline look like? Who do I think will fit this role in the next five years? Sadly, 56% of companies are still at level one. And although 71% of companies think people analytics is very important, there are really just 4% doing this type of analytics. And this has been a trend for a fairly long period of time considering that people analytics is not new. It’s not this year’s new technology. It’s been around for a while. What are the problems and why are we still at this operational reporting level? I’m going to walk you through what the traditional products are that comprise a people management suite. Let’s start with recruiting and onboarding because that’s where people enter your company. You no longer – well, we hope that you no longer – recruit people by cold calling them and not knowing anything about them, operating on a standard job description. When such people enter your company you don’t know what to do with them or you put them into a role that they didn’t join your company for in the first place. Most large companies go through this. I think startups are off the hook here. What has changed in recruiting is before you had human resources with very large job descriptions that were collated over time and then sent out to the market. You got candidates after a very long cycle. By the time you got them, maybe the reason why you wanted them in the first place had changed. This is very common nowadays. But the other more important issue is now the model of working is moving to teams. You want to assemble teams for the purpose of a particular project. You assemble teams with complementing skills, they do the job, they disassemble and they move on. This is very similar to SWAT teams or what they call the Hollywood principle where you assemble a cast for a movie. They have the right skills for the job at that given point in time. They do the job well. And then they disassemble and various parts of the team go on to form other teams. You no longer want that team that’s been in your company for 10 years. They’re just there as a team because that’s the way they’re painted on your organization chart. That also leads to problems such as: How do you train them? How do they learn new things? When you start recruiting for a team, you need to be very agile. You need to know immediately what this person needs to do in the team. What is the role he or she needs to fulfill? What skills do they need? And then you need to recruit very precisely. You don’t want to recruit someone and then have them go through a long training program; by then your team has moved on. These are some of the changes in recruiting and onboarding. And you will note that it’s very much linked to your team composition, the positions open at the time, the skills required, and the learning required. The next is learning or training. It could be for compliance, and it could be for retaining people. From BBC Capital, a study showed that only 12% of the employees apply new skills learned in their training to their actual jobs. And this shows a very large disconnect between training departments and teams actually working on the ground. What you are trained for is not necessarily what you can apply to your job. This is good in one sense because employees learn new things, but it’s also bad because they learn irrelevant new things. And then they take that skill and leave your company to apply their learning somewhere else where it’s relevant. You might think that you are training to retain, but if you train for the wrong thing, you actually lose people because they find that they can no longer use those wonderful new skills that you’ve trained them on. You have nothing for them to do. So this is a problem with training, with learning really. And with learning, there are a couple of stages that are not addressed very well in today’s learning management suites. The first stage is immediate learning where you need to learn enough to be good at your job right away. The second is intermediate, where you need to catch up on competencies and grow in your current role. You’re in a position. You want to grow further somewhere, so what do you learn? What should you learn? This depends on two things. First, what is your employee interested in doing? Second, what career plans do you have for your employee? This is intermediate learning. Finally, you have long-term goals that are more transitional about what do you need to do as a person to grow your career to some number of years down the line. If companies can help employees do this learning or provide them with enough opportunity to find this learning themselves, they end up retaining these people and also building succession plans. Here’s a simple example (pictured below), if you were to put learning into a graph. Learning can be quite complex, especially when you go down to competency management, fulfilling competencies in a variety of ways. 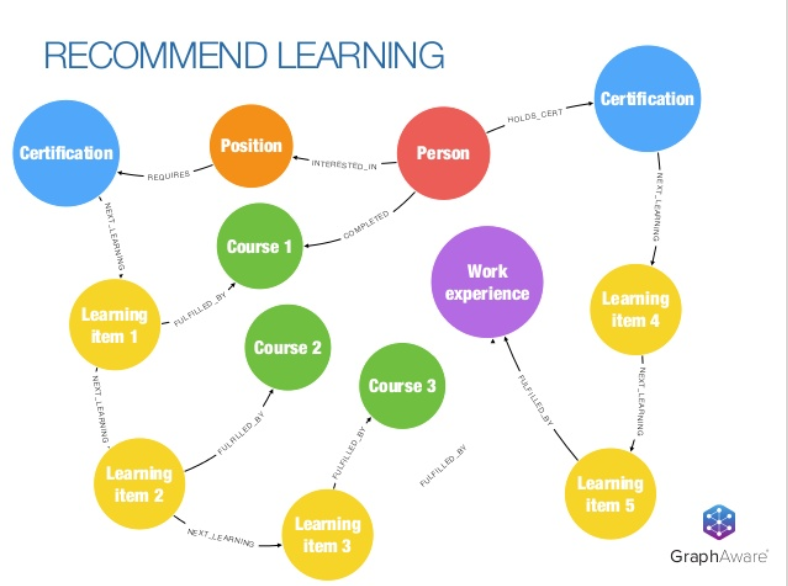 You have different ways to acquire certifications, and you have a lot of compliance around certifications, which expire at various points in time. For some of them, you take an online course. For others, you must attend an instructor-led course. Some of them require a combination of courses and work experience and so on. It’s hard to query. It’s hard to find out – given a person and an end goal – all the steps she needs to do to acquire all the skills if you are querying a relational database. But if you’re using a graph, it is extremely easy. 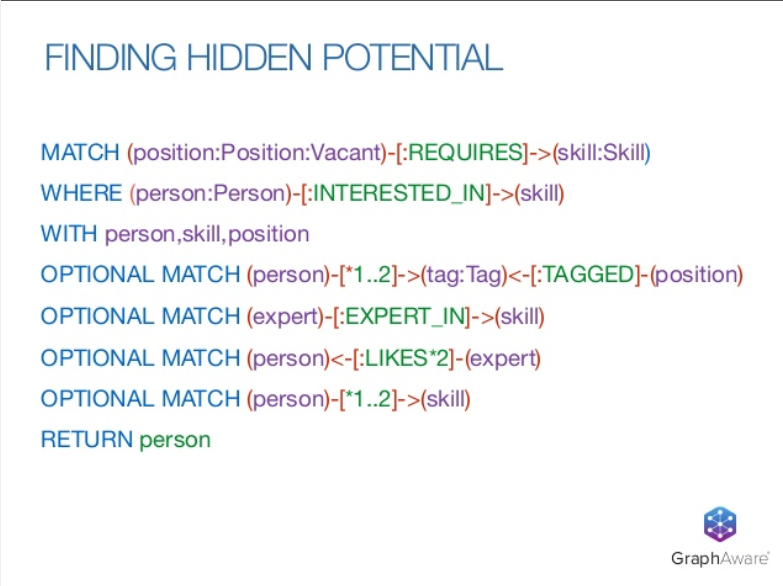 You can already see that you’ve got a person who is interested in a position. Now that position requires a certification, which is fulfilled by a couple of learning activities. Some of them are courses; some of them are work experience. The interesting thing is this person already holds a certification. He’s completed the learning. He’s completed the work experience. And that work experience is also applicable to the new certification that he needs for that position. So really the delta that he’s looking at is attending one course. And that is a very easy answer. It is very easy to motivate people to actually learn something to move them up. And it’s relevant because you know that this skill is needed for the new position. 82% of companies report that they are not worth the time. Most of them report that there’s widespread manager bias and the results do not motivate anyone. What has changed here in performance management is the time that millennials started joining companies. Millennials are used to providing feedback. With everything you do on the Internet, you provide some sort of feedback. So if a manager can rate me, I also want to rate my manager. I think that’s fair, right? Most employees will agree that you want to rate your managers and you would expect that if your manager had a bad rating that you would no longer work for that manager, but we all know it never happens. Managers rate you badly, but that’s about it. Performance management is really important because of the whole feedback trend. You need people to take action on their performance reviews and this actually links back to learning. You need to know who to promote. You need to identify the kinds of people in these teams who could be high-performance people but are not team players. They’re still very valuable to your organization, but maybe you need to move them out of your team. 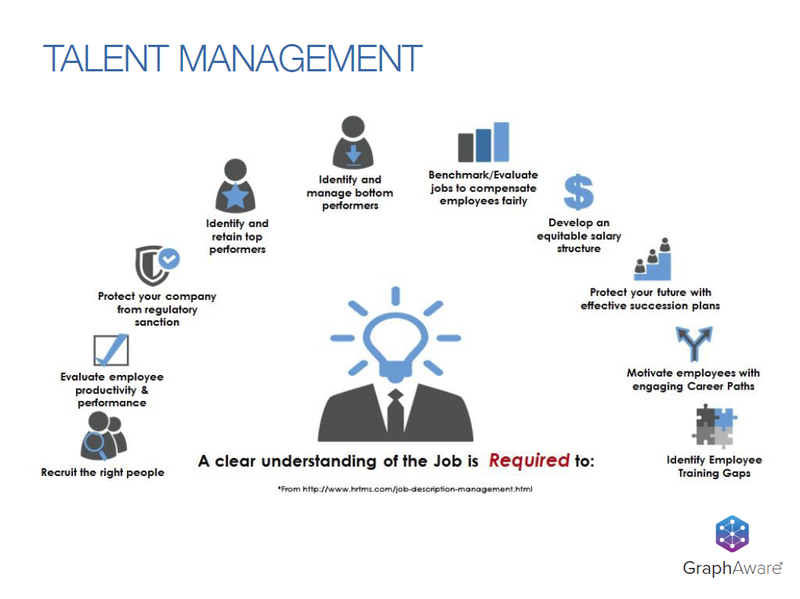 Talent management is extremely important, as everyone knows. You want to find people who attract talent. You want to recommend learning to people so that they can take on the next challenge. You want to find new skills that people have which you are not immediately aware of just because it’s not on their official job description. There are a lot of studies over the years that show that intelligence, agility, self-management, and self-discipline are characteristics of high-performance individuals, and that high-performance individuals learn by doing. These are the kinds of people who you want to identify and you want to promote because that is how they learn. And there are always characteristics that apply to certain kinds of people. This is highly related to talent management, and it’s still a problem that people are trying to solve. Here’s another use case: Finding hidden potential if you were to model your organization in a graph. In the image above, we have a person in the center in blue, and he holds certifications, has some skills, currently works in position 1, has some work experience, but he also wrote blogs, maybe externally, maybe on your internal company network. He has attended various courses, and he’s interested in another vacant position – which you may or may not know directly. You might know because you just did a performance review. You might know because he’s applied to that position through your internal hiring portal. What’s also important is that you get a lot of information. Sure everyone writes a blog, but how good is the blog? What is the blog about? Maybe it’s about skills that you did not know this person had, or maybe it’s validated by an expert in your company who has a skill needed for the position that your person is interested in. So you’re basically endorsing people internally by finding out who has who has endorsed him and validated the fact that he knows what he is talking about. Who has rated him, who has reviewed him? And therefore this is a real use case from a previous place that I worked at where you had people who had all these skills and wanted to be in positions, yet the company was hiring from the outside. They just didn’t know that these people were sitting in their organization. When we put it into a graph, we surfaced these people and, in fact, those four people went on to be the new iOS team and were hugely successful afterward. How hard was it to create that query? 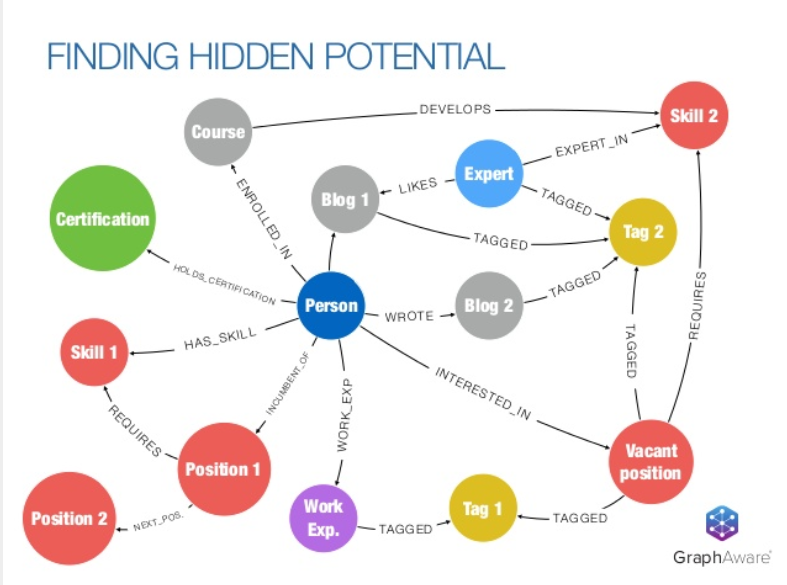 We called it “finding hidden potential.” If you have a graph of your organization, it only takes a couple of hours to write the query and surface the information you need. You just need one Cypher query of this form (pictured below), which basically says, find the position that’s vacant, the skills it requires, people who have these skills, preferably people who have been validated by other people who are hopefully experts. It’s very simple. Even if you do nothing fancy, this query will give you a lot of information on skills that you didn’t know existed in your company. 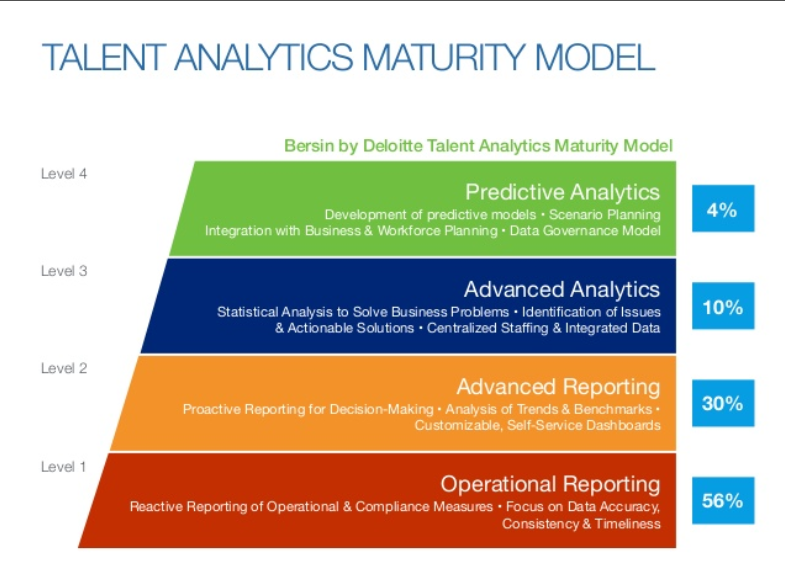 Now we get to people analytics, which brings together what was once called human resources and your business data. Neither makes sense alone. You have to merge them. You need to identify high-performing people. You need to analyze flight risk. Most companies are fairly surprised when key people leave. This presents compliance risks, which goes back to learning, identifying career paths, and having people on this career path. You have a very high-value career path with someone who has probably entered a leadership position. But do you have anyone in your company that you can actually groom for this position? What are the characteristics of high-performance sales teams, for example? These are very strong use cases for people analytics. And once you find out why your sales teams are so good, you figure out which people comprise that sales team. What are their characteristics? You then you look for similar people – whether inside or outside your company. A fairly recent example of people analytics being applied to most domains is sentiment analysis, which is extremely important in companies for two reasons. One is for negative sentiment, where you identify toxic people. Toxic people have a way of spreading negative vibes quickly. The sooner you find these people and the sooner you remove them, the better. On the positive side, some people are very good at communicating messages. They amplify messages. And finding these people is also important because sometimes companies need to push new policies which might be slightly controversial. But if you find the right people to convince and carry that message throughout your company, you will have a much higher success rate rather than sending out an official notice from the CEO. We know how that works. Sentiment analysis is extremely important: What do people feel about the projects they’re working in and the people they’re working with? The managers they’re working with? It ties all the way back to performance and learning. Let’s take a look at what is interesting in this year’s predictions, especially the one from Bersin. All through the previous years, they have been talking about finding one magic database that will combine information from all the systems. But this year, it looks like everyone has finally accepted that this is never going to happen. There are too many large companies with too many large systems and a lot of investment in them. So these systems of record are here to stay. It’s good that it’s finally put to rest: You’re not going to replace everything with one database. And that is perfect because what you want to do is extract what is valuable insights from all these systems of record and connect them. Here’s another interesting trend. 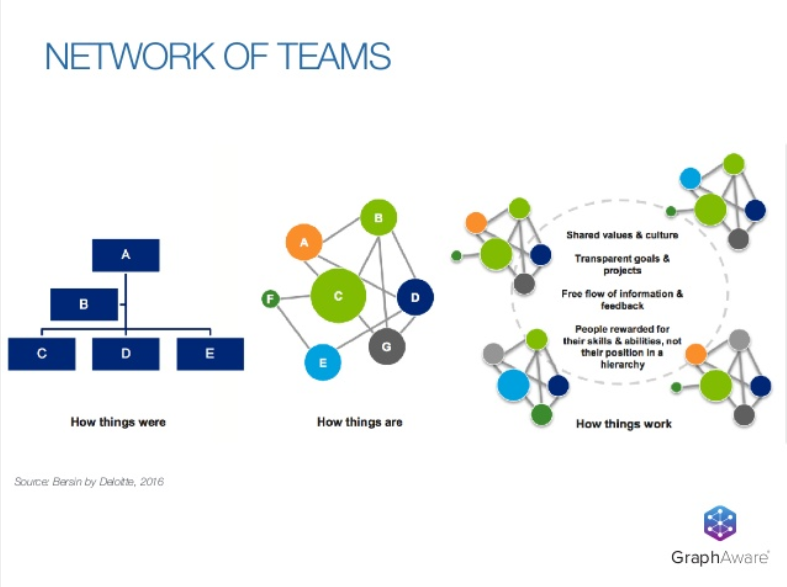 Earlier when these reports started off, from Forrester and others, they started with a hierarchy for team structure. Over the last two years, they started talking about networks of teams, which is where things are now. But in this year’s report, they’ve actually shown how teams keep changing and how they’re united: they are united by common goals and values, reward, feedback and sharing knowledge. This is very important and represents a marked shift from last year. It did not even exist, although we spoke about it. And this validates where we are going: everything has to be connected for you to get value out of it. The other important thing is when you have connected information, you start finding out things that were hard to find out before. Organizational network analysis is a big topic. There are a lot of people in this field. And some of the very simple things you can get out of it fairly quickly are three types of people. First, you’ll find core connectors, the red figures in the image below. Core connectors are highly collaborative people. They work well within teams and across teams. They make sure that your organization stays together and that knowledge flows through the organization. They are very, very key people. If you remove enough of them, you’ll find that your communication breaks down, so it’s very important to make sure that this does not happen. You need to keep a good balance of knowledge flowing in your organization. The second type of person is a bridge (indigo in the image above), who connects two disparate sets of people or sub-organizations. There are many organizations that are still fairly siloed and you’ll always find one or two people who act as communicators between these silos. It’s good because at least you have some communication between them. It’s bad because this person becomes a bottleneck. The same actually applies to co-connectors, who are usually high-performance individuals. It’s good, and you want to encourage this, but you also want to know who those people are because over time base fatigue sets in. There are well-known studies that show high-performance people experience burn-out at some point in time. There is only so much that they can coordinate and maintain relations with other people in the organization. You want to identify these people, and you want to move them around. And the last are the peripherals (grey in the image above), the people who sit on the edge. They’re probably very good, but they’re also not very good team players, so you want to make sure that they stay on the edge, where they contribute as best they can. If you put a non-team player into a team and force them to be a team player, it almost never works. Nobody will be happy: not the team, and not the peripheral. So it’s very important to find this out, and it’s easy to do so because once you have your social networks and you’re analyzing connections, you get this for free. Now I would like to quickly revisit people management. We spoke about these four products within the people management suite. Sitting in individual silos, you’re applying graphs to each of them, but the real value is not in each silo. The real value is when you bring them all together. Recruiting is impacted by learning. It’s impacted by talent attractors in your company. It’s impacted by what you’re looking for, the skills you need. 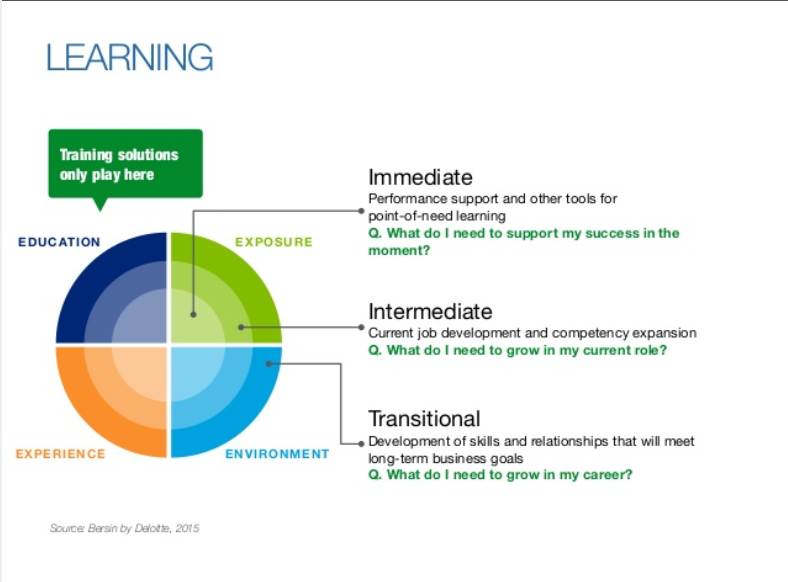 Talent is also impacted by the learning you provide to your employees. It’s also impacted by the quality of people you hire. If you dilute the culture of your company, you’ll find that the people that started that culture will leave. Performance is extremely important because it links to everything else. It cannot be that standard 360-degree, rate yourself against organizational goals. When you connect everything – and this is a very small snapshot of everything – you have people and the things they do in your company. They write blogs, they write articles, they earn positions, they have skills, they are part of teams, they provide feedback to other people within teams across projects. 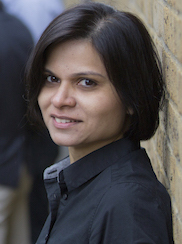 You have sentiment within teams across projects, experts in your company, knowledge sharing. So you want to find out who is contributing content and who are your engaged employees. Engaged employees are productive. Disengaged employees tend to become dangerous employees. You want to engage them, or let them go, or you want to fix your company. One of the three. Many companies have studies to show that they have run into losses purely because knowledge was not shared at the right time with the right people. You want to enhance knowledge sharing. You want to make sure that the people who share knowledge continue to share knowledge. And you want to enrich all the data you have in your company with other complementing data. Learning to talent, talent to performance, performance to recruiting, and so on. To summarize, people in organizations naturally fit into graphs. Your organization is a graph, there’s no denying that. All your information lies in the relationships. Graphs open up unexplored avenues in these relationships. The moment you put your data into a graph, you will immediately find many things that you can do that you hadn’t even thought of before. Finding cohesive teams, detecting communities, finding influences, finding talent attractors are all classic graph problems. Click below to register for the North America GraphTour happening in a city near you all across the U.S. and Canada – and connect with leading graph experts from around the globe. Great, fantastic article. write more fantastic article my love !